We left A Gudiña around 7:30 am and set out for a 35km day. Although not that ambitious of a goal, the Galician terrain is certainly much more taxing than what we’ve seen thus far. We walked along Main Street in the dim light of a belated dawn. (Remember that the further west we go the later the sunrise.) It has also been much warmer these past few days and Mikey has set out in shorts and no jacket. We were, however, faced with a small dilemma concerning which path to take. But, with more railway related delays on the left path, we opted to go right and walk directly to Laza. The beginning was a bit frustrating given the absence of highway shoulder and prevalence of commercial trucks. Still, the scenery was amazing and most of the ascent was over rolling hills. Shortly before leaving the highway, we were graced with this fantastic view of the Camba River. 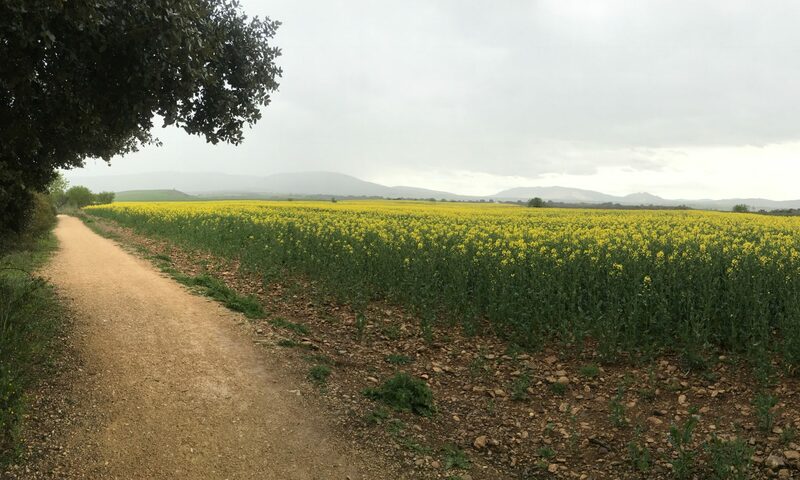 We are continually amazed by the vast emptiness of the land and complete solitude found at times along the Camino. Mikey enjoys the pace of urban living, but there are some quiet moments in which he is completely happy and at peace in his aloneness. And there are times when his panting breaks the silence as he struggles up a steep hill swearing all the while about how any decent society would install an escalator. Just around the bend, we happened upon this small barn-like structure. Talk about a motley crew, but these guys were quite curious about an equally motley pilgrim looking in on them. Still, just as we approached their gate, we heard a halfhearted woof and noticed a sleepy mutt laying on the ground nearby. Sorry, kids, no jailbreak today. Following a short sandwich break in the tiny village of Campobecerros (also today’s stop for most pilgrims on this stage), we continued on for another 15km. This part of the hike was incredibly beautiful with green, rolling pastures and cattle that appeared to be ants in the distance. At the apex of one climb, we came across this weathered cross. Below it, on many of the rocks, were inscriptions from past pilgrims. Some memorialized loved ones while others merely established that a particular pilgrim had once, if only fleetingly, existed here on this hilltop. Perhaps our time spent writing this blog is a digital attempt to fulfill a similar desire. Vini, vedi, vici and all that jazz. This was a pretty cool self-service rest stop about 6km away from our destination. It contained a hodgepodge of snacks and even hot water with teabags for the tired pilgrim. There was a donation box, but it is (at heart) just one of those unmanned stops that seeks to make the pilgrimage a little more bearable. Views like this really help, too. Perhaps today was cathartic in the dramatic vastness of the mountain terrain. In fact, we took relatively few pictures of the unfolding scenery, opting instead to merely enjoy the beauty of nature and try to preserve it in the mind’s eye. We arrived in town and found the albergue right away. Although it took us nearly 20 minutes to locate the police station where we paid and got keys to the dorm, the actual accommodations weren’t too shabby. Oh – you’ll love this: we walked into the town hall and were given bad directions. We found the emergency room at the hospital, but it was closed. Finally, a cleaning lady at the closed hospital came out and directed us to the police station. When Mikey later mentioned that we had a hard time finding an unmarked police station, the on-duty officer simply replied, “Yes, our sign fell off the building some time ago and we have yet to replace it.” There was neither immediacy nor hope in his explanation. After settling in and checking out the town, it was time for dinner. The bill of fare? Salad, a nice steak, french fries, apple pie, bread, wine, bottled water, and coffee. It was a pretty good dinner for 9€. Well, it seems that we are again the last ones awake at the albergue. With 33km to travel tomorrow, we should probably end this post. Oh, and if your wondering, we are scheduled to arrive in Santiago by or before this time next week! Yes, there are some 35km+ days ahead of us, but we also have our last rest day scheduled for Monday. That said, keep reading and we’ll be to Santiago and beyond before either of us knows it. Ultreia, dear reader.